So wrote John Morley, one of the greatest of the British 19th century Classical Liberal proponents of peace and free trade, a few days before the outbreak of the Boer War. This long and damaging conflict had the result that land, which was both at the very periphery of the British Empire and occupied by a small number of independent Dutch settlers, was ruthlessly annexed for the British Crown. And I believe we really do have to go back to the Second Boer War before we reach a British government engaged in a more unjust war than the present imposition of naked force on Iraq. Despite the clear opposition of world opinion in general, and countries which have been traditionally supportive of the West in particular, it has been determined that the present Iraqi regime should be toppled. Why has this happened? It has to be admitted that most of the reasons given in the media by both pro and anti-war groups leave much to be desired. We are, for instance, told that Iraq is bulging at the seams with weapons, some of such destructive capability that the US, the UK, and indeed the whole civilised world is in danger. This argument has cut little ice with anyone possessing an IQ over 80. Iraq, no economic giant to begin with, has had sanctions imposed on it for the last ten years and is in a parlous state. During this time, U.S. and British planes have been bombing Iraq in a leisurely fashion and, as far as can be ascertained, not one U.S. or British plane has been shot down by the Iraqis. Why won’t the Iraqis use their extensive arsenal even to defend themselves? The sheer absurdity of the'Iraq and Weapons of Mass Destruction' argument can be best illustrated by turning the present situation on its head. Imagine that it was Iraqi planes which had been bombing the UK for the last ten years from bases in - shall we say - France. What would the reaction of the British public be to an announcement by the Iraqi leader that the UK constituted a fearsome danger to Iraq and other nations around the world? In these circumstances, we might find the odd British citizen who would point out that it was not the UK doing the bombing and that it was Iraq, in fact, which was the real danger to world peace. Has the Iraqi regime got links to international terrorist networks, in particular, Al Qaeda and the infamous Bin Laden? 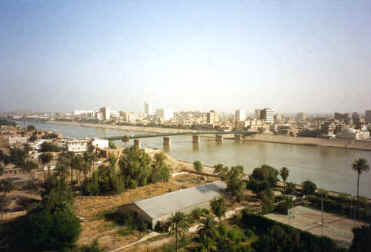 Despite the most protracted efforts, no clear link has been established between Saddam Hussein and Bin Laden, whilst a number of people have pointed out that the secularist, socialist regime in Iraq is precisely the sort of government that a religious fundamentalist like Bin Laden most despises. As a cautionary note however, one might point out that continual threats and pressure on Iraq (or indeed any country) might well produce a marriage of convenience with terrorists. History shows us that one time enemies have united temporarily against a common adversary. There was no more implacable enemy of Bolshevism than Winston Spencer Churchill, but when Hitler invaded the Soviet Union in June 1941, the British Prime Minister immediately proposed an alliance with Stalin against the common danger. Are the American and British governments prosecuting this war to free the Iraqi people and launch democracy in an area of the world which is widely regarded as a political slum? When one looks at Bush, Blair, Straw, Rumsfeld, Perle and Chaney one can imagine many things, but it is difficult to see them as the Bolivars of the Middle East. 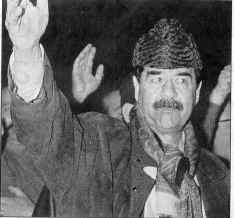 We might also recall that in the first Gulf War of 1991 when the Kurds and Shiites of Iraq rose up against Saddam Hussein, support from the Allied Coalition (staffed then by many of the leading figures of the present war party) was noticeable by its absence. But what of the argument that even if democracy in the Middle East is not the immediate aim of the war, might not a more beneficial political order be a welcome side-effect of the invasion? The sober truth is that no one really knows. The consequence of the invasion could just as well be that terrorists strike at further targets in the West and, perhaps more importantly, destabilise and overthrow pro-Western Arab governments. The much invoked comparison of democracy returning to Japan and Germany after defeat in World War Two and present day Iraq is both wrong and facile. Wrong - because democracy never left Japan. During World War Two Japan preserved its democratic institutions just as effectively as the UK. Facile - because both Germany and Japan had a tradition of democracy and free institutions to build on, something which simply does not exist in Iraq. One can scarcely resist adding that war against Japan and Nazi Germany occurred because they were expansionist powers who had attacked many nations (of which the UK and US were just two). Most people see World War Two as a justified defensive action followed by occupation and tutelage to ensure good government and future peace. It’s perfectly clear that a pre-emptive strike against Iraq is a totally different proposition and can in no way be seen as a defensive action. Interestingly, the democracy-at-the-point-of-a-gun-for-Iraq groups have begun to sound like good old-fashioned 19th century imperial idealists who always justified their empires by pointing to the abolition of the slave trade, creation of schools, railways and health services - in short the'white man’s burden’. Do the anti-war groups have a better explanation for the coming war? Mostly, they spend their time correctly pointing out the damage that war causes, but are unfortunately handicapped by an attachment to the overriding importance of the economic causes of war. Their case can be best summed up in one short word - oil. Saudi Arabia is backward, not likely to be stable in the future and the Americans do not wish to be dependent on such a country. Iraq has some of the highest reserves of oil in the world and therefore has to be brought under political control to feed the voracious appetite of the American consumer for petrol. This argument is wrong at several levels. 90 per cent of American oil comes from the Western Hemisphere and with Russia and the former Soviet satellites becoming huge producers in their own right, the importance of Saudi Arabia is exaggerated. Further, if Iraqi oil supplies are so important, why have the US placed an embargo on these very supplies over the last ten years? Surely, if oil were of overriding importance, it would have been better to strike a deal with Saddam Hussein, a deal which he would undoubtedly have been all too willing to make. The simple truth is that wars in the Middle East involving Western powers endanger rather than secure their supply of oil. The Arab oil embargo of the 1970s prompted by Israel is an obvious example of this. I well remember arguing with a left-winger who maintained that the Falklands War was all about securing the rights to oil in the South Atlantic. Twenty years on we can see that no attempt has been made to exploit any oil fields around the Falklands. Oil is also not the key to the Iraq question. A comical feature of the Iraq crisis for this writer has been the almost bovine worship of the United Nations in so many quarters. In the UK the opposition to the war has been vociferously stating that their future support for the war was conditional on the securing of the much cherished'second resolution' by the UN Security Council. But what if the US and UK had been able to twist sufficient arms and grease the required palms to gain the magic second resolution? We would then have been faced with the remarkable prospect of the anti-war groups saying, “Oh well, I know that this war is wrong, but because the UN has given its approval, the war must be right”. Was the anti-war feeling so feeble that this would have happened? The delight of Bush and Blair would have more than matched that of the Kaiser in 1914 when the German Social Democrats, who had previously been sure that the working class knew no national boundaries, suddenly agreed that workers did in fact belong to different national groups and were therefore at leave to happily kill each other. As it turned out, the anti-war groups had no need to worry. The diplomacy of the war powers, particularly the UK, has been astonishingly inept throughout the crisis. Although history shows us that nation states have the right to arm themselves to the gills if they possibly can, the proposal from the start of verifiable and reasonable benchmarks for disarming Iraq might have won over most opinion. But the US and UK became obsessed with ad hominem attacks against Saddam culminating in the absurd demand that he broadcast to his own people in Arabic to say that he was a miscreant. If anyone were naïve enough not to think that the US and the UK were simply looking for a casus belli against Iraq, they would have been disabused at this moment. Fine, the reader may say. But if it’s not about weapons of mass destruction, bringing democracy to the Middle East or oil, why are 250,000 American, British and Australian troops massed to invade Iraq? As the British and Australians would not be there but for the Americans, we might rephrase the question and ask, why does America want to control Iraq? The events of September 11th 2001 had a tremendous psychological impact on the US, turned Bush into a hugely popular president and made radical action against a nuisance to the US in the Middle East a political possibility. At the turn of the last century, the Boers in the Transvaal operated independently of British authority in Southern Africa, and it was found to be an intolerable affront in London that this area of the map was not coloured red. I cannot help but believe that the US government regards Iraq in the same way. Strategically, the existence of an Iraq which is not beholden to America is an irritant which cannot be allowed to long continue. True, these are the dreams of great powers, but great powers also have the military strength to indulge such fancies. The US will invade Iraq not for urgent reasons of state, but because it is powerful, because it can and because another military outpost will look rather good on the map at the Pentagon. Central to this volume are the views of Ludwig von Mises on war and foreign policy. Mises argues that war, along with colonialism and imperialism, is the greatest enemy of freedom and prosperity, and that peace cannot be achieved until major nations become limited in scope and power. It has to be admitted that most of the reasons given in the media by both pro and anti-war groups leave much to be desired. We are, for instance, told that Iraq is bulging at the seams with weapons, some of such destructive capability that the US, the UK, and indeed the whole civilised world is in danger. This argument has cut little ice with anyone possessing an IQ over 80. As a cautionary note however, one might point out that continual threats and pressure on Iraq (or indeed any country) might well produce a marriage of convenience with terrorists. History shows us that one time enemies have united temporarily against a common adversary. There was no more implacable enemy of Bolshevism than Winston Spencer Churchill, but when Hitler invaded the Soviet Union in June 1941, the British Prime Minister immediately proposed an alliance with Stalin against the common danger. The much invoked comparison of democracy returning to Japan and Germany after defeat in World War Two and present day Iraq is both wrong and facile. Wrong - because democracy never left Japan. During World War Two Japan preserved its democratic institutions just as effectively as the UK. Facile - because both Germany and Japan had a tradition of democracy and free institutions to build on, something which simply does not exist in Iraq. The simple truth is that wars in the Middle East involving Western powers endanger rather than secure their supply of oil. The Arab oil embargo of the 1970s prompted by Israel is an obvious example of this. I well remember arguing with a left-winger who maintained that the Falklands War was all about securing the rights to oil in the South Atlantic. Twenty years on we can see that no attempt has been made to exploit any oil fields around the Falklands. Oil is also not the key to the Iraq question. But what if the US and UK had been able to twist sufficient arms and grease the required palms to gain the magic second resolution? We would then have been faced with the remarkable prospect of the anti-war groups saying, “Oh well, I know that this war is wrong, but because the UN has given its approval, the war must be right”. Was the anti-war feeling so feeble that this would have happened? At the turn of the last century, the Boers in the Transvaal operated independently of British authority in Southern Africa, and it was found to be an intolerable affront in London that this area of the map was not coloured red. I cannot help but believe that the US government regards Iraq in the same way.